ZN63A-12KV indoor high voltage vacuum circuit breaker is aindoor equipment with three phase AC 50Hz and rated voltage of 12kV, which can be used for the control and protection of electrical facilities in industrial and mining enterprises, power plants and substations, and is suitable for frequent operation places. The voltage vacuum circuit breaker can be operated frequently and has the ability to break and reclose multiple times. The product is designed as front-rear assembling structure, it not only can be used as fixed installation unit, but also can be used as handcart unit through equipping with chassis, and has a reliable interlocking function. ZN63A 12KV circuit breaker meet the standards: GB/T1984 and JB/T3855. ZN63A-12 indoor high voltage vacuum circuit breaker produced by TAIXI Electric is the fifth generation VS1 indoor high voltage vacuum circuit breaker. It has reliable interlocking function and can be operated frequently. It has the cability to break and reclose multiple times. The indoor high voltage vacuum circuit breaker is composed of the operating mechanism and the arc extinguishing chamber, which can be used as a fixed installation unit or as a separate handcart equipped with a chassis cart. 6. No operating in such places as subject to dust, smog, corrosive / flammable gas, vapor and salt pollution. Rated operating voltage (V) AC110/220; DC110/220 AC110/220; DC110/220 No opening subject to the operating voltage of opening coil below 30% of rated operating voltage. The 12KV circuit breaker is equipped with an intermediate sealing type ceramic or glass vacuum interrupter, uses copper-chromium contact material, cup-shaped magnetic field contact structure, its contact electric wear rate is small, the electric life is long, and the withstand voltage level of the contact is high, stable dielectric strength, the arc recovery speed is fast, the interception level is low and the breaking cability is strong. The overall structure of the indoor high voltage vacuum circuit breaker adopts the operating mechanism and the front-rear arrangement of the arc extinguishing chamber. The main circuit part is for three-phase floor-type structure. The vacuum interrupter is vertically installed in a tubular insulating tube. The insulation barrel is made of epoxy resin and is poured by APG process, so it is especially resistant to creepage. This structural design greatly reduces the accumulation of dust on the surface of the arc extinguishing chamber, not only can prevent the vacuum interrupter from being damaged by external factors, but also can ensure high resistance to the voltage effect even in the environment of damp heat and serious pollution. The upper outlet seat 28 is fixed to the upper bracket 27 on the arc-extinguishing chamber to the static contact inside the vacuum arc-extinguishing chamber, through the movable contact and its connected conductive clip, and is softly connected to the lower bracket 30 and the lower outlet seat 32 . The operation of the indoor high voltage vacuum circuit breaker and the contact of the contacts are accomplished by the insulation rod 34 and the internal dish spring 33 through the indoor high voltage vacuum circuit breaker connecting rod system. The circuit breaker is equipped with a dustproof insulation cylinder cover at each current level. It is not necessary to remove the rated current of 1250A and below in actual use, and it must be removed when the rated current is 1600A or above. The operating mechanism is a plane-arranged spring energy-storing operating mechanism, which has a manual energy storage and an electric energy storage function. The operating mechanism is placed in the mechanism box in front of the arc extinguishing chamber. The mechanism box of the 12KV circuit breaker is used as the frame of the operating mechanism simultaneously. The mechanism box is divided into four middle partition boards into five assembly spaces, during which the storage and energy storage parts, the transmission part, the tripping part and the buffer part are installed respectively. The front part is equipped with joint, ON-OFF button, manual energy storage operation hole, spring storage state indicator, and ON-OFF indicator. In this way, the arc extinguishing chamber and the mechanism make up a whole to make the two more consistent, reduce the unnecessary intermediate transmission link, reduce the energy consumption and noise, and make the function of the 12KV circuit breaker more reliable. 4. The 12KV circuit breaker has the advantages of long service life, simple maintenance, no pollution, no explosion risk, low noise, and the like, and is more suitable than frequent operating conditions and other harsh working conditions. The 12KV circuit breaker can be loaded into a handcart type switchgear, also be used for fixed switchgear. The 12KV circuit breaker uses an arc extinguishing chamber with vacuum and insulating medium and has a very high vacuum degree. When the movable and static contacts are electrically separated under the action of the operating mechanism, the arc will be generated between the contacts. Due to the special structure of the contact, a suitable electromagnetic field is also generated in the contact gap, which promotes the diffusion of the arc and evenly distributes the arc to the surface of the contact to burn to maintain a low arc voltage. When the current naturally zero, residual ions, electrons, and metal vapors can recombine or condense on the surface of the contact and the shield in the time of the microseconds, so that the dielectric strength of the fracture of the arc-extinguishing chamber is recovered quickly, yo extinguish the arc and achieve the breaking. The energy required to close the indoor high voltage vacuum circuit breaker is provided by the closing spring energy storage. The energy storage can be done by an external power drive motor, or done manually by the energy storage handle. Energy storage operation: The electric output torque of the energy storage motor fixed on the frame is driven by the unidirectional bearing of the motor output shaft, or the storage handle is inserted into the manual energy storage hole to shake clockwise, and the sprocket wheel is rotated through the worm gear and worm. Then, the chain wheel is driven by the chain to rotate. When the sprocket rotates, the slider on the driving wheel of the gear pin drives the energy storage shaft to rotate. And through the two side arm tension closing spring for energy storage. When the energy storage position is reached, the limit bar on the frame presses down the slider, so that the energy storage shaft is disconnected from the sprocket transmission system and the storage energy keeps the wheel to hold the roller. At the same time, the energy storage position is kept and the energy storage indicator is turned over by the dialing board on the energy storage shaft. The energy storage mark is displayed, and the stroke switch is switched to cut off the power supply of the energy storage motor. At this time the indoor high voltage vacuum circuit breaker is in preparation for closing. After the mechanism stores energy, if the closing signal is received, the closing solenoid will act or press the closing button to keep the energy storage shaft rotating, drive the tweezers to release the roller, release the energy storage and the closing spring releases energy, so that The energy storage shaft and the cam on the shaft rotate clockwise. By turning the arm, the transmission plate drives the insulated pull rod to drive the movable contact to the closing position, and compresses the contact spring to keep the contact pressure required for the contact. After the closing operation is completed, the closed position is maintained by the closing curtain and the half shaft. At the same time, the energy storage indicator, the energy storage stroke switch is reset, the motor power supply circuit is connected, and the ON-OFF indicator board displays the "close" mark, if the external power supply is on, it enters the energy storage state again. Note: when the 12KV circuit breaker is in the closing state or the lock device is selected and the external power supply and the handcart type 12KV circuit breaker are not connected in the process of propulsion, the closing operation can not be carried out. After the closing operation is completed, once the opening signal is received or the opening button is pressed, the opening tripping electromagnet or the over-current release electromagnet act, so that the restriction of the half shaft on the closing brake is relieved. The static and dynamic contacts of the arc extinguishing chamber are separated by the energy stored in the contact springs and the opening, and the operation is carried out. In the post opening process, the hydraulic buffer absorbs the remaining energy during the opening process and limits the opening position. The on-off indicator plate shows the "Open" mark, at the same time, the counter is pulled to realize counter counting, the main auxiliary switch is switched by the drive linkage. 1. 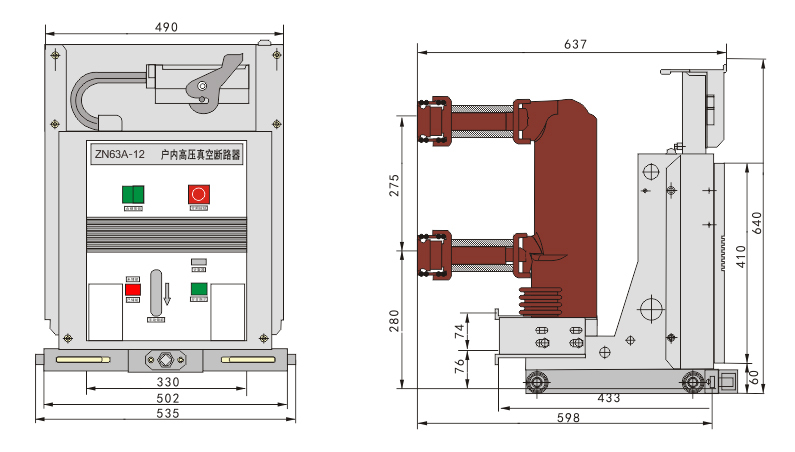 After the closing operation of the indoor high voltage vacuum circuit breaker is completed, the closing interlocking bending plate moves down to buckle the closing and hold closing bending plate on the shaft, and the circuit breaker cannot be closed again when the circuit breaker is not opened. 2. After closing the circuit breaker, if the closing electrical signal is not removed in time, the internal anti-trip control circuit of the indoor high voltage vacuum circuit breaker will cut off the closing circuit to prevent multiple reclosing. 3. When the handcart type circuit breaker has not reached the experimental position or working position, the interlocking bending plate buckles the pin on the closing trip, and the indoor high voltage vacuum circuit breaker will not be closed to prevent the circuit breaker from entering the load area in the closing state. 4. 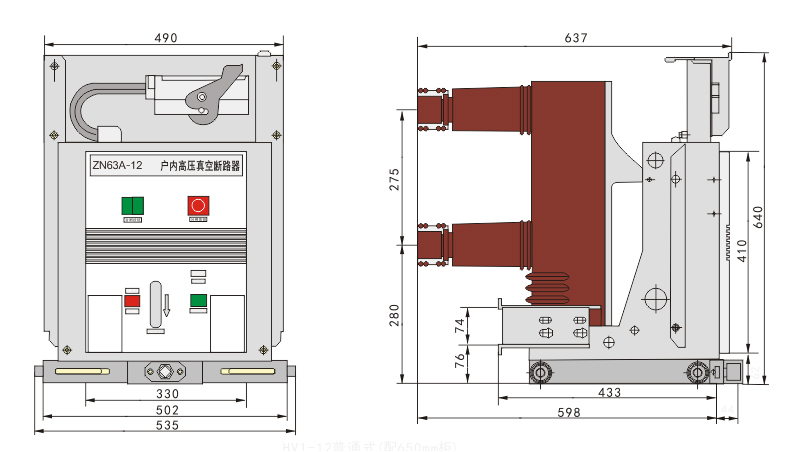 After the handcart type indoor high voltage vacuum circuit breaker is closed at the working position or test position, the roller lock mechanism will lock the plate, and the handcart will not be able to move to prevent pulling out or pushing the load zone in the closing state. 5. If the electric closing lock is selected, the manual closing operation is prevented when the secondary control power is on. Note: The closing power consumption is 4.5W and can be operated normally at 0.8-1.1 times rated voltage. 1. The 12KV circuit breaker can be installed either as a fixed unit or as a trolley unit with a chassis. 2. When lifting the circuit breaker, the hook should be hung on the lifting hole on the indoor high voltage vacuum circuit breaker. When moving, the upper and lower contact arms must not be subjected to force, at the same time, the circuit breaker should not be subjected to large shock vibration. 3. The 12KV circuit breaker should cooperate with the cabinet cooperate and operate. a. The connection bolts between the inlet and outlet of the fixed circuit breakers and the main circuit bus should be tightened to ensure good contact. b. The handcart type indoor high voltage vacuum circuit breaker is pushed into the cabinet with the special transport car. When the circuit breaker enters into the test/isolation position, the chassis car lock plate and the cabinet body should be well matched. c. Insert the special handle into the operation hole of the chassis and turn clockwise to advance and counterclockwise to exit. The 12KV circuit breaker can only be pushed or exit in the opening. The circuit breaker trolley propulsion stroke is 200mm. d. The handcart type 12KV circuit breaker can only perform the opening and closing operation in the test position and the working position. When it is in the closing state, the circuit breaker trolley cannot be moved. 4. Connect the control circuit correctly, the internal circuit diagram of the indoor high voltage vacuum circuit breaker (see Figure 5 to Figure 8 for details). a. Manual energy storage: Insert the dedicated energy storage handle into the manual energy storage operation hole clockwise. After the energy storage is in place, the energy storage indicator shows that it has stored energy. b. Motorized energy storage: Switch on the energy storage motor operating power and the motor will automatically store energy. After the energy storage is in place, the motor energy storage circuit is automatically cut off, and the energy storage indication shows that it has stored energy. 2. After clo sing and opening the switch, after energy storage is completed, manually press the "Close" button or turn on the control power to make the closing solenoid act, that is, closing can be realized; when the switch is opened, manually press "Breaker" The opening of the sub-gate solenoid can be achieved by pressing a button or turning on the control power supply. 3. The operator should understand the structure of the indoor high voltage vacuum circuit breaker, read the product instructions carefully, and operate it correctly as specified. 1. Because of the use of vacuum interrupter device for indoor high voltage vacuum circuit breaker, special-purpose sliding bearings and long-acting greases are used, so the main body of the circuit breaker is maintenance-free under normal conditions of use, but due to the difference in the use environment, the product still needs to be in operation. Perform the following maintenance on a regular basis. a. The dust and dirt on the 12KV circuit breaker surface are cleaned depending on the environment. Wipe the surface of the insulation with a dry cloth, and then remove any contamination with a silk cloth moistened with detergent. b. Insulate the indoor high voltage vacuum circuit breaker at least once a year to check if the vacuum interrupter is leaking or if the insulation strength of the insulator is reduced. If there is any abnormality, it should be handled or replaced in time. c. When the circuit breaker is idle for a long period of time, the active part of the 12KV circuit breaker may be blocked. Therefore, the 12KV circuit breaker shall be operated at least once a year (including 5 times each for energy storage and closing and opening operations). d. For frequently operated indoor high voltage vacuum circuit breaker, the wear of moving parts in the operating mechanism should be checked frequently, and if necessary, the moving parts can be filled with lubricating oil. To prevent accidents, maintenance work should be performed when the indoor high voltage vacuum circuit breaker is in a state where the breaker is not stored. The handcart circuit breaker is not completely in the test position or working position. Note: the dimensions shown in brackets are for rated current greater than 1600A. Note: L must be shorted when AC110V or DC110V. 1. The warranty period for all products sold by our company is one year. Free maintenance is provided during the warranty period. The company will repair and replace it in accordance with the detailed provisions of the warranty (except for failure or damage caused by human factors or irresistible natural phenomena. ). 2. After receiving the notice of repair, we will arrive at the scene within seven working days and solve the problem. 3. The user can consult the relevant technical problems by telephone and get a clear solution. 4. When the performance failure during normal use, the company promises the above warranty service. c. Failure or damage due to alteration, disassembly, or assembly of the product. f. If the user has any unknown or special requirements, please contact the manufacturer.